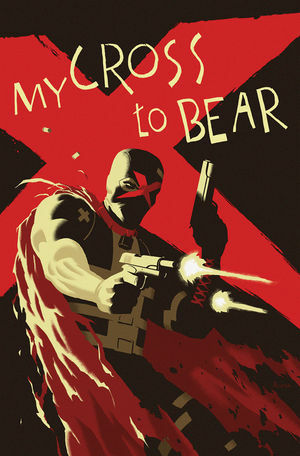 The first thing that I said after reading this was “that was intense!” Dark Horse’s classic X returns! This crime drama is written by Duane Swierczynski with art by Eric Nguyen. X is most certainly a fast read, in the best way! If you want to see some bloody action, read this comic. 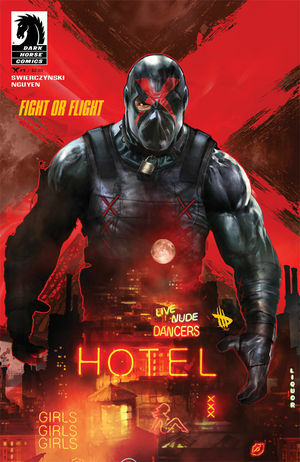 Vigilante X serves up justice raw and uncut…or in his case, cut – a lot. Set in the town of Arcadia, blogging muckraker Leigh Ferguson is investigating the mass criminal murders that have been happening in town. The interesting thing is that the criminals aren’t the ones doing the murdering, but the ones being murdered! X marks the spot on these criminals, and X is on a roll. But will Leigh turn out to be an ally? You’ll have to read the series to find out! The writing will definitely keep you on your toes with your heart pumping as this fast-paced drama unfolds. Swierczynski does a great job making you want more, especially with the cliff-hanger that the comic ends on! That kind of storytelling mixed with the raw art of Nguyen is a great combo for this series. It can get pretty gory, but Nguyen captures everything really well. The art is very dark, which fits the story superbly. Dark Horse is definitely on a roll with this one, and I can’t wait to read more. X is in stores now, so go check it out!